My eyebrows barely had the time to fall back into place as I asked an affable, wide-eyed jungle native to repeat himself during a brief interaction. “I ate bats with Bill Bailey!” he said again, referring to the popular British comedian. 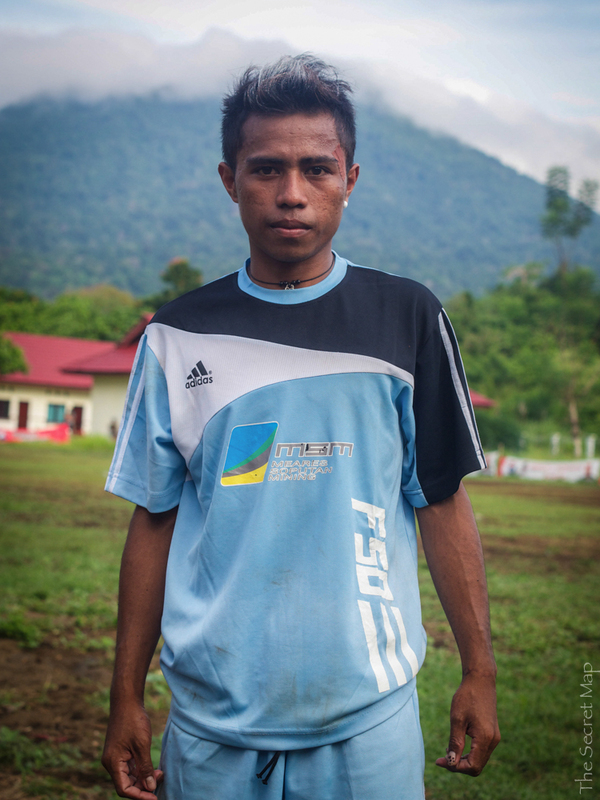 Famous on home soil, yet a seemingly obscure name-check out in the far throws of South East Asia. How did this come about? Allow me to rewind. I was in Tangkoko National Park, on the northern tip of Sulawesi – the lesser-known, sporadically-formed island across from Borneo and above Bali in the Indonesian archipelago. 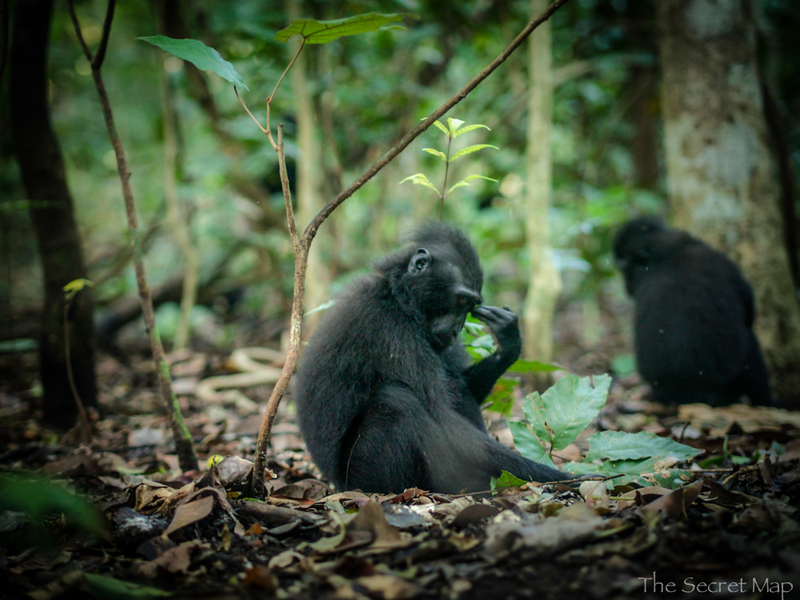 After experiencing the peculiarities of human life in Sulawesi’s Highlands, I had traveled to the northern tip of the island looking to enjoy the company of the cartoonish-looking Sulawesi Black Crested Macaque. After watching a football tournament, I booked a tour guide, a gentle and wholesome lady named Renny, who was a family member at mine and my travel partner’s guesthouse. However, on encountering another guide shortly after, I started to have doubts. “I can get you a good photo of the monkeys eating bananas from my knee,” he excitedly proclaimed with the eyes of someone who has clearly been having fun out here. As a portrait photographer, his pitch was appealing. I envisioned him knelt down, banana-baiting a salivating simian as he gave me the spiele: “Come and watch a video of me eating bats with Bill Bailey tonight.” Sure enough, that evening I witnessed the troll-looking British comedian break bat wings with a couple of guides, including my new friend. We watched Bill Bailey’s Jungle Hero, a BBC travelogue that saw the intrepid Mr. Bailey traverse through Borneo, Brunei, Sulawesi and New Guinea following the footsteps of Alfred Russel Wallace. Wallace, the British naturalist and explorer had been “airbrushed out of history”, according to Bailey. The documentary was his way of paint stripping the walls of history, roughly speaking. It was in and around this very jungle that Wallace devised his theory of a physical divide between the animals in Sulawesi, which were Australasian in origin, and the animals in nearby Borneo that are classically Asian. The separation was due, in theory, to land movement. The divide has since become known as the “Wallace Line”. Wallace, in correspondence with his hero Charles Darwin, collaborated on the theory of evolution and was jointly published with Darwin’s papers, with Darwin’s name taking prominence. Subsequently, The Origin of Species was published and Darwin took the glory, whilst Wallace’s name was consigned to the history books. The bat-eating guide seemed like a lot of fun, but I’d already made an agreement with Renny, and I wasn’t going to leave her in the corner. After witnessing a group of Tarsiers (the tiny primates that inspired the creation of Yoda) return from a night’s hunting at 5 a.m., Renny and her sister (who is also a guide) led us to ‘Rambo 2’, the most friendly of the four troops of Black Crested Macaques, curiously named after the Stallone franchise. 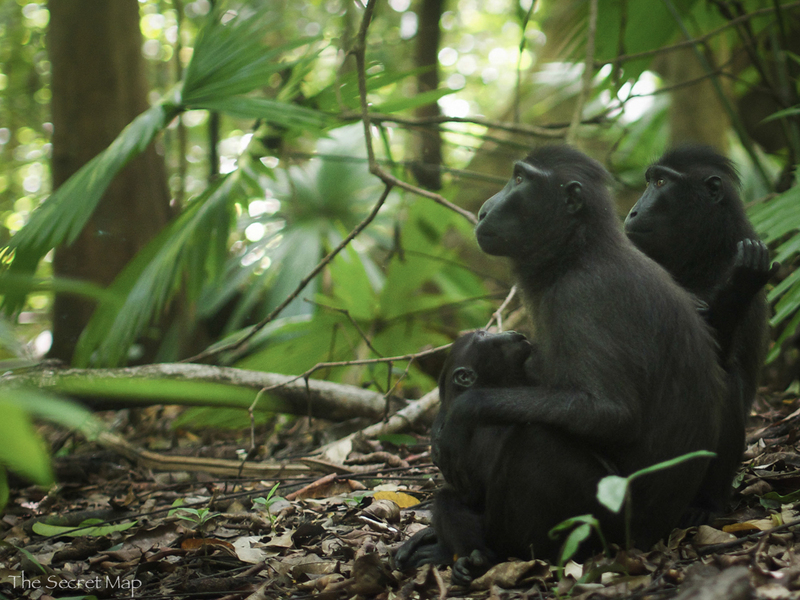 Instead of luring them with food as you might do with an orangutan in Borneo, as we walked through the forest the first thing we noticed was snapping twigs from all sides, and we became suddenly engulfed in a mass of macaques. Being used to human contact, they weren’t at all worried by our presence, and before we knew it, we were part of their primal quest for berries, grooming, play fights, and finding a final spot to recharge their biological batteries so that they could to do it over again the following day. The simple life. 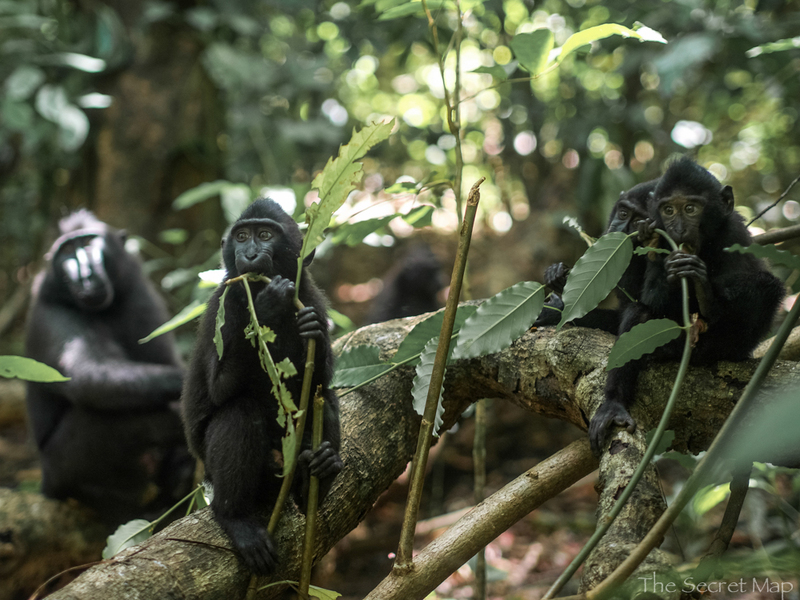 Rambling through the foliage with the black crested macaque is an overwhelming sensation, like stepping through the TV screen into Attenboroug documentary. 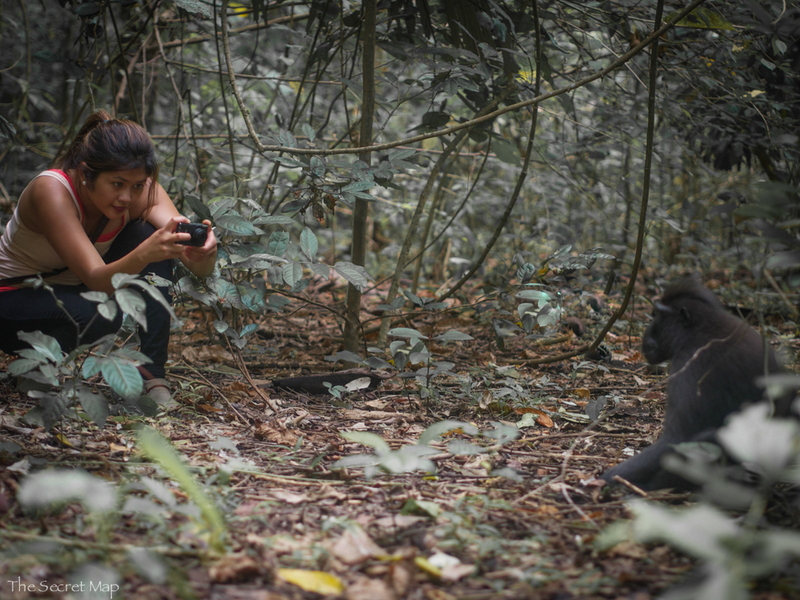 Despite an initial time frame, Renny allowed us to follow them for as long as we wished – a testament to her and her sister’s love of both the ‘macaca nigra’, the jungle, and the art of guiding. As a second day’s outing came to its end, the alpha male of Rambo 2 seemed particularly at ease. Renny called me over to come and sit with him. 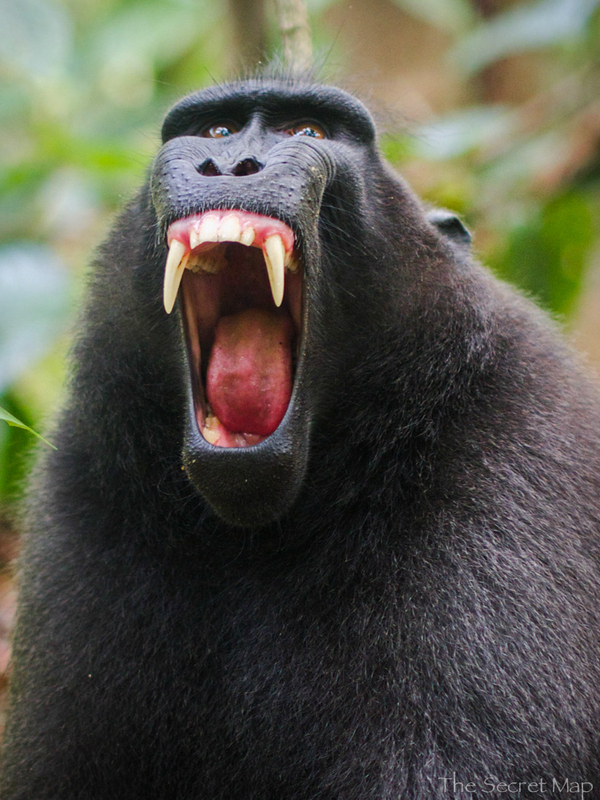 His relaxed yawning revealed his huge incisors. Then he did something remarkable. As Renny sat down nearby, he got up and walked over to her, sat down next to her, and placing his hand gently on her outstretched boot, they locked eyes. The look between them painted a picture no amount of banana-baiting could match. There was a kinship there that transcended species. This article was originally published in Busan Haps. More of The Secret Map can be found on the Facebook page. Renny can be contacted for guide services at Renny_linggar@yahoo.com and she operates from the guesthouse Tarsius. that video is so amazing. I showed it to that video producer who stayed in our hostel in Shirahama.